Irish anarchism is often seen as a movement which started in the late 1960s and early 1970s, with just a minor pre-history of lone individuals prior to that. Historian Fintan Lane has done much to correct this misunderstanding, particularly with his book The origins of modern Irish socialism, 1881-1896 (Cork University Press, 1997). When we read of Irish revolutionaries in the 1880s, we read of the Irish Republican Brotherhood (popularly known as the Fenians) rather than the anarchists who were becoming influential among advanced radicals in much of Europe. 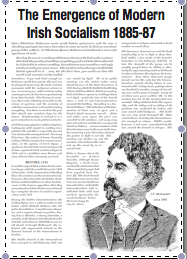 With the dominance of nationalist ideas among Irish radicals of the time, neither Marxism nor anarchism had many supporters here. But that is not to say that there none. 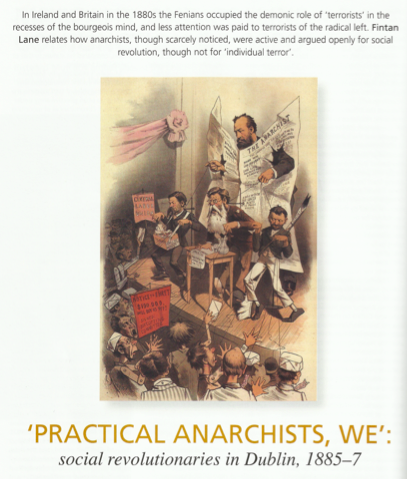 We have two articles by Lane: Practical Anarchists We was published by History Ireland in March/April 2008 (vol.16, no.2), and The origins of modern Irish socialism, 1881-1896 in Red & Black Revolution (no.3) in 1997.